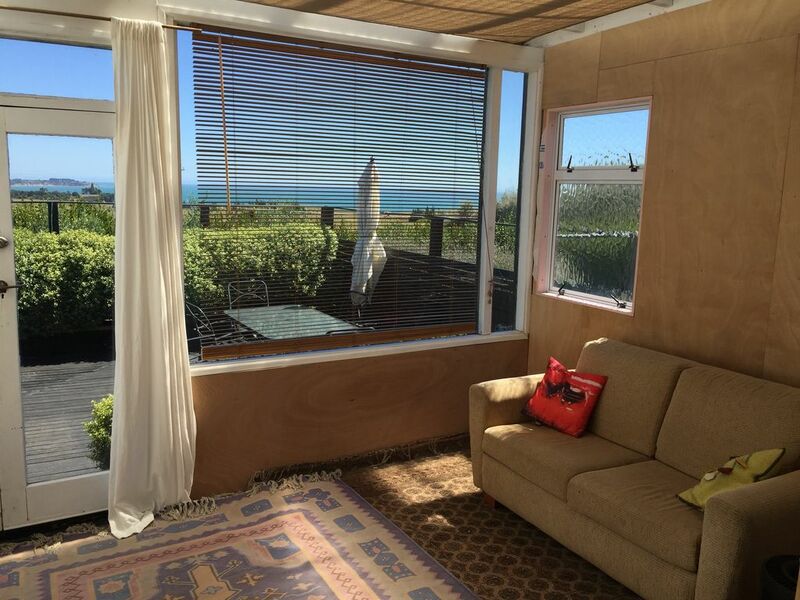 Our comfortable, warm, roomy 3 bedroom country villa overlooks the sea at Urenui, near New Plymouth. There are two double beds and 4 singles. We will provide these as fully madeup beds. There are also double convertible sofa beds in the two lounges, bedding provided. Good broadband wifi (Spark) but Vodafone is limited to 3G coverage. We provide all the usual household and kitchen needs, including a coffee plunger. Heating: heat pump, woodburner and electric heaters. If you want to be fed and entertained as well, we can negotiate that (we like cooking but we are not professional caterers!). Check out the photos. We’re excellent hosts, live right next door and we just love the place. Please note: location is 30km north of NP on a quiet no-exit road 400m off SH3, between two safe swimming beaches at Urenui and Onaero with allegedly good fishing. Urenui has an excellent licensed 4 Square mini-market, a great cafe (Mud Bay), hotel, gas station, golf course and one of North Taranaki's best fish and chip shops. Richard and Jill are committed to their guests having an affordable quality experience at any time of year and that’s why they get such great reviews. They communicate well ahead to provide route and location information and also to ensure that any special requirements are catered for. Richard is a semi-retired journalist and editor. Jill is a retired ESOl teacher. Both keen gardeners. The house is big, has an amazing view and and all of the necessary facilities, including a spa pool to relax in in the evenings. Richard was kind and helpful during our stay. We recommend staying here to anyone coming to Taranaki. Well behaved, sociable group of guys here for a wedding, some golf and sight seeing. Left the house very tidy and clean and we’re happy to recommend them to others. We spent a week with family of five, three nice bedrooms, the house was surrounded by pretty gardens and had a lovely rural outlook. Situated close enough to New Plymouth city being 30 mins drive away and Mt Egmont National Park being 50 mins drive away it was great to do activities during the day and then relax in the wonderful spa every evening on the sunny deck. Nikki & Co were very nice people who respected the house rules etc and left it clean and tidy. Nice and quiet. Had all that we were looking for. The wife loved the spa pool. beautiful view of the sea. beautiful view of the sea. great spa!! The beds were comfortable and the house nice and warm. The beds were comfortable and the house nice and warm. Good location with nice views. The spa was great for relaxing in after a long day.